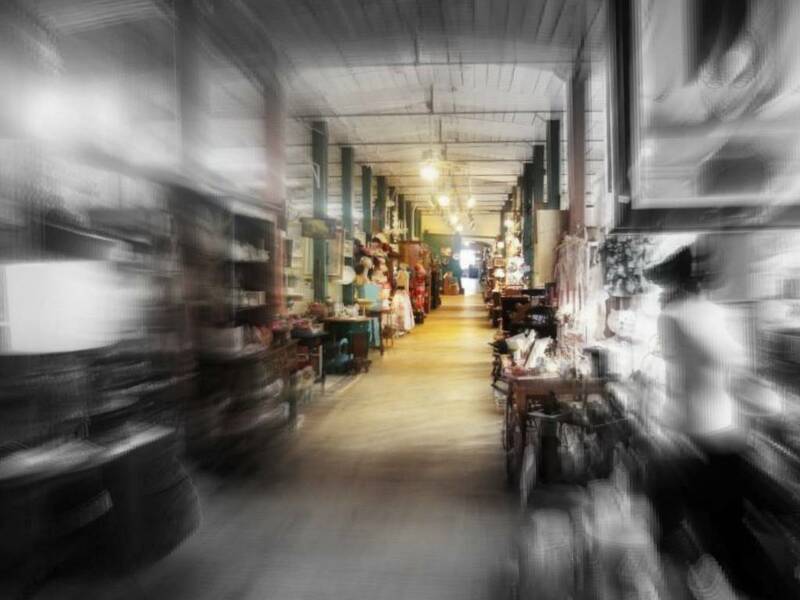 It was just a casual stroll down many long aisles amidst the usual fare in antique shops on a holiday weekend. I had nothing in mind. Looking for something in particular and not focusing on what’s there can lead to disappointment at the day’s end. Leave it to chance. Look at what’s there. That’s when the unexpected introduces itself. Or, in this case, herself. It was quite a historic introduction. I met a woman in chains. 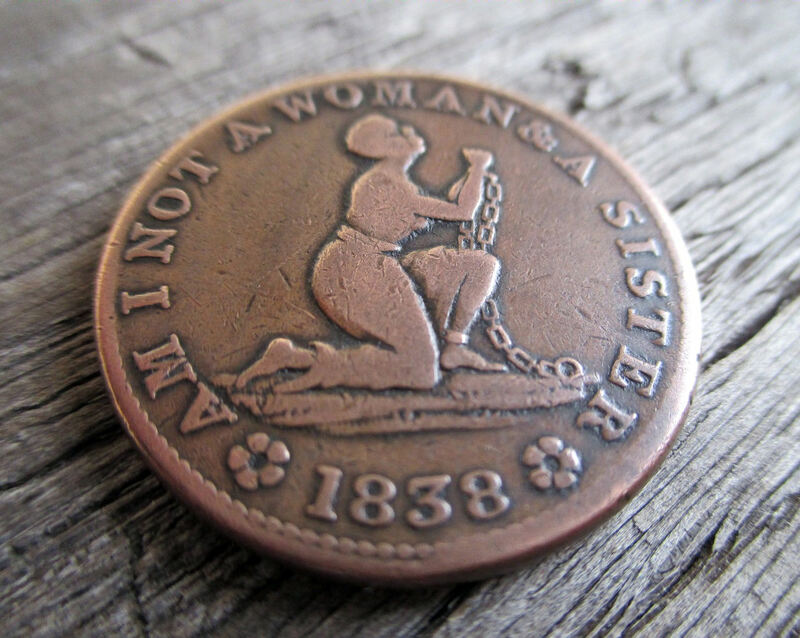 She was a slave on an 1838 ‘Hard Times’ token. A heavy large cent copper coin about the size of a half dollar. On bended knee, chained to the ground, she’s appealing to the heavens for equality and freedom. 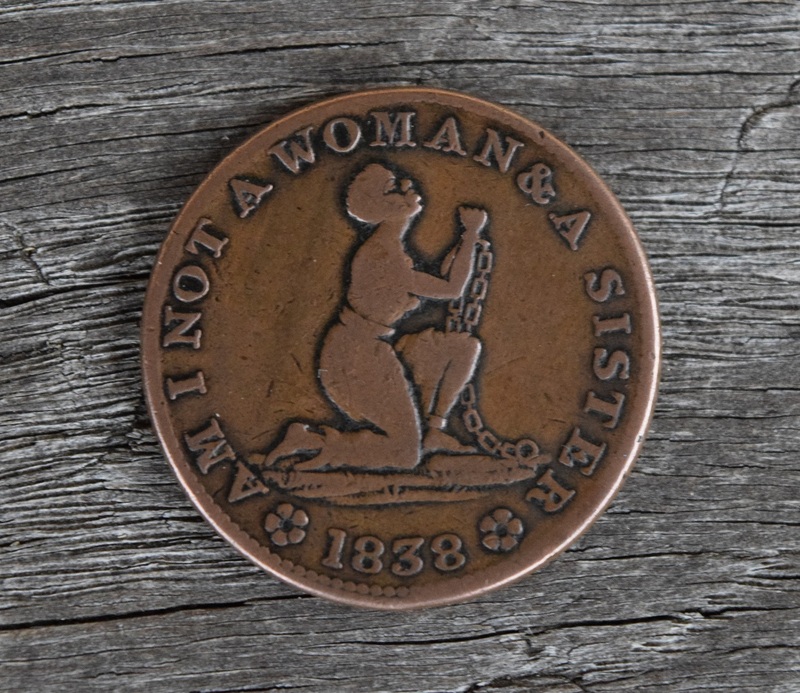 An anti slavery token. I had never seen one before. The reverse could almost be mistaken for a government issued cent. To avoid charges of unlawful counterfeit, the N is backwards and the words ONE CENT could not appear on the coin. The die cutter had an issue with the 8 in 1838. 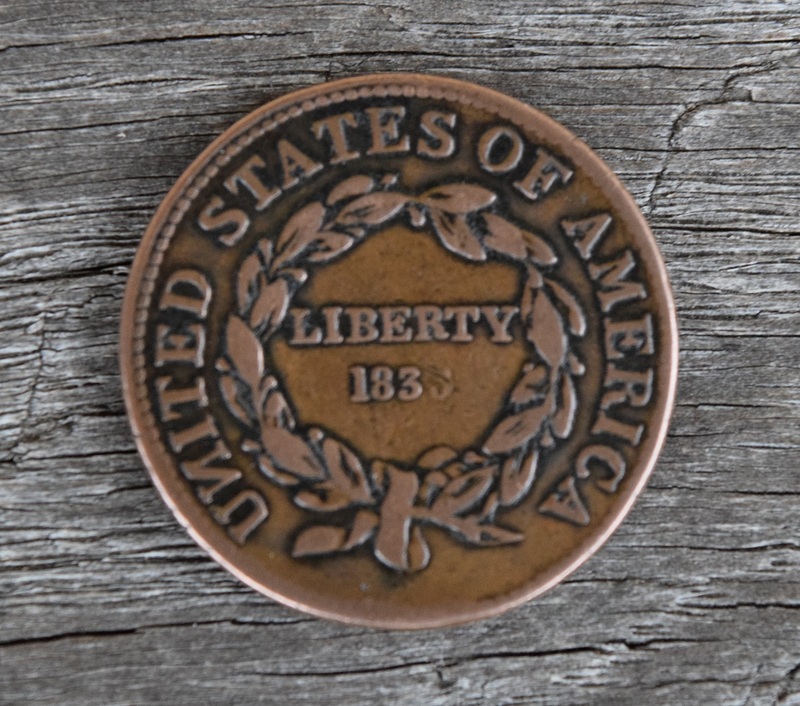 Citizens were hoarding coinage, which forced stores and businesses to commission tokens to make change. These hard times tokens featured advertisements for store or business, political satire, and in this unique case, the abolitionist movement. 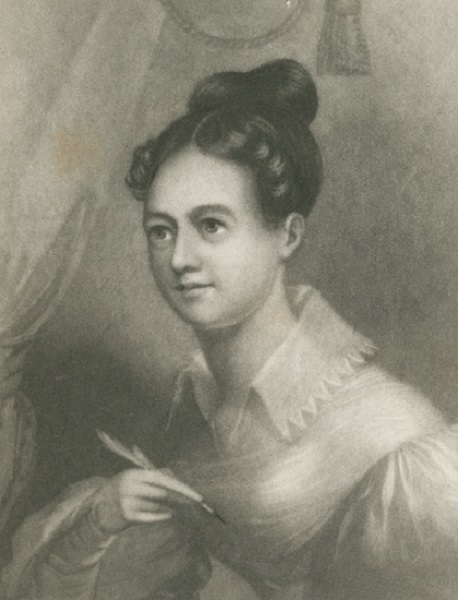 Writer and poet Elizabeth Margaret Chandler from Philadelphia. Raised by Quakers, her anti slavery writings were prominently featured in newspapers. Born in 1807, she died in 1834, not long before her 27th birthday and four years before the coin featuring her poem’s motto was created. 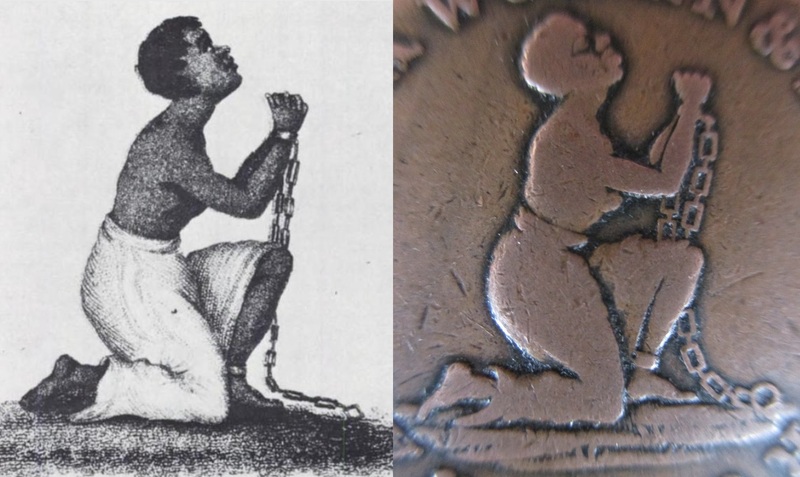 It was an African-American engraving apprentice and abolitionist, Patrick Henry Reason, who engraved the image in 1835 for the coin. By doing so, he challenged the notion that African-Americans were not capable of artistic works. Born in New York City in 1816, he set up shop as an engraver and by 1869, he joined a firm in Cleveland, Ohio, and created jewelry and engravings until his death in 1898. African-American abolitionist and engraver Patrick Henry Reason. 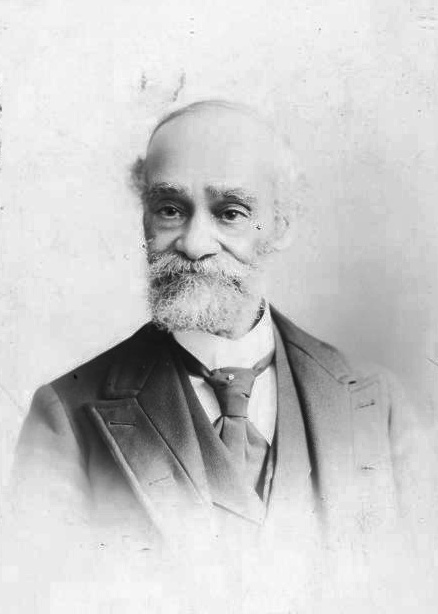 Photo circa 1890’s. This particular anti slavery design was created in England by renowned potter Josiah Wedgwood in the 1780’s. His medallion featured a shackled male slave in black and white jasperware with the question: AM I NOT A MAN AND A BROTHER? Original late 18th Century Josiah Wedgwood anti slavery jasperware medallion. 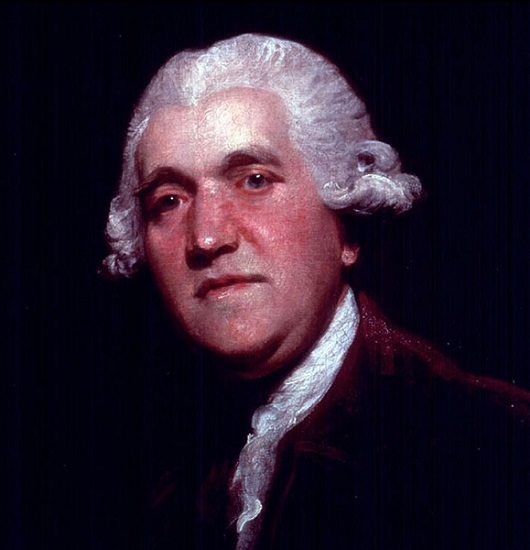 Wedgwood sent examples across the pond to fellow abolitionist Benjamin Franklin in Philadelphia. There was an English token minted in 1797 featuring Wedgwood’s design, but in America, for reasons unknown, (Perhaps the female in chains sentiment was more appealing to the public) the male version was never produced here in the states. Outside of America, many different versions of Wedgwood’s male slave design tokens were made. 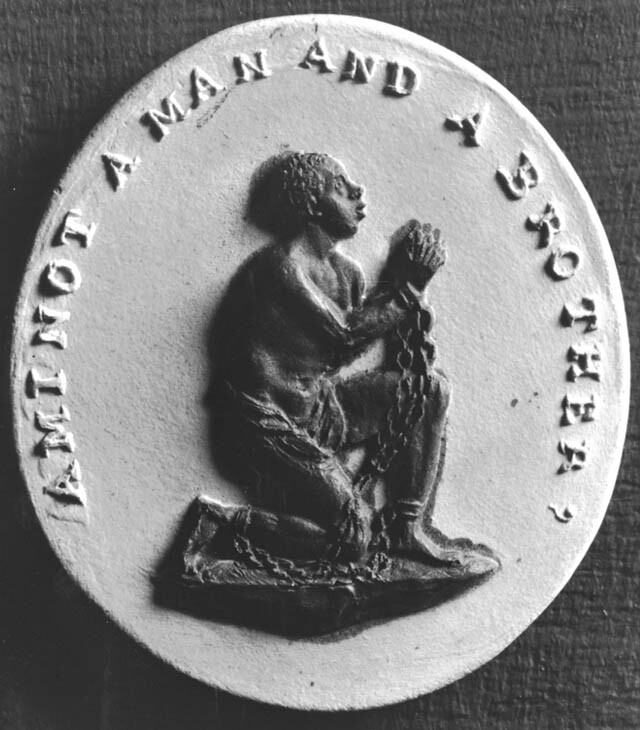 The 1797 Wedgwood inspired anti slavery medallion produced in England. In 1807, England outlawed the slave trade, but not slavery itself. By 1833, England had abolished slavery in all the British Empire save for a few colonies, which, by 1843 complied with English law. Slavery in America had finally ended with the Civil War in 1865. 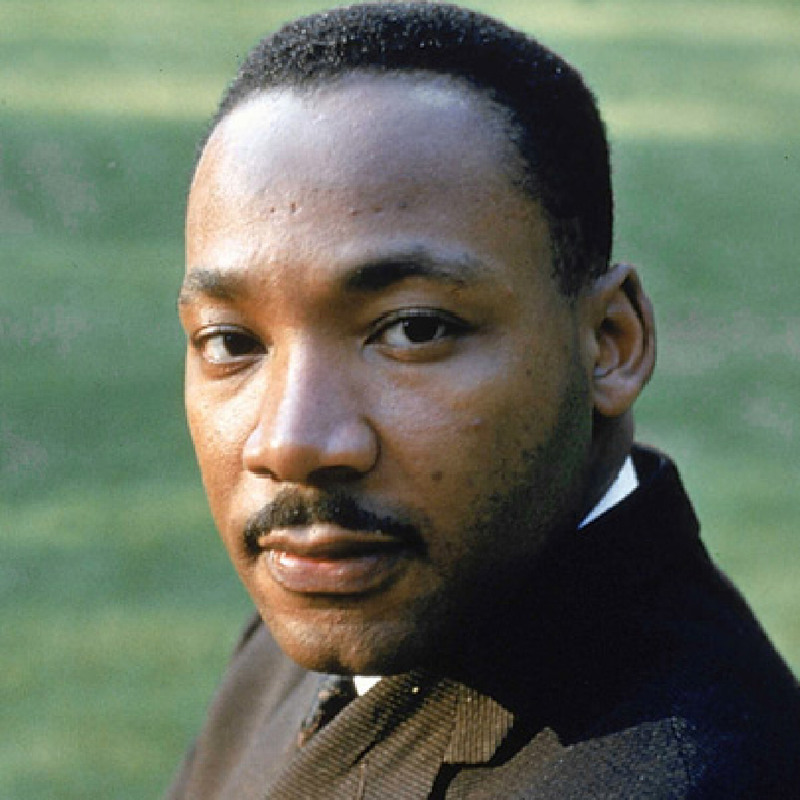 One hundred years later, African-Americans were still struggling for Civil Rights in the 1960’s. I wasn’t looking for anything in particular when I found this historic reminder of the African-American struggle for freedom. I was just out antiquing on a holiday weekend. That holiday was a great man’s birthday. He was a true leader. He wasn’t on the forefront of my mind the moment I discovered and felt compelled to acquire this unique historic piece. It is possible he may have been on my mind at an unconcious level. Perhaps Providence led me right to it with him in mind. It was his birthday, but I got a present. To be reminded, to never forget.